Egypt’s Defense Ministry has appointed Maj-Gen. Khaled Megawer to oversee the North African country’s military intelligence agency. 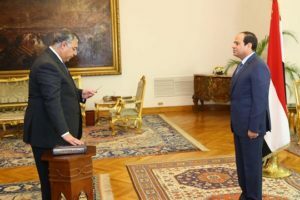 The statement announcing the appointment made Sunday said Megawer will replace Maj-Gen Mohammed Farag el-Shahat who is promoted as assistant to the defense minister. Khaled Megawer, a career soldiers, was el-Shahat’s deputy. He commanded the 2nd army and also served as military attaché in Washington. Abdelfettah al-Sisi has rubber-stamped the appointments. Al-Sisi was himself Chief of the agency before being appointed defense minister in 2012. The following year, he deposed the country’s first democratically elected President Mohamed Morsi. He won a new four-year term in March this year in unchallenged elections.